Gibe III Hydroelectric Project, Ethiopia – The project has started producing energy and is expected to be in full operation by August, 2016. 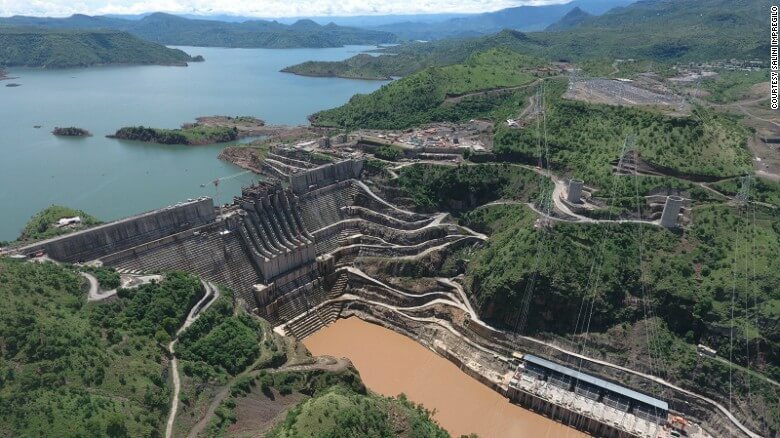 With all turbines switched on, it will have an outgoing power capacity of 1,870 megawatts, according to the Italian company, Salini Impregilo, which is building the dam on behalf of Ethiopian Electric Power. (CNN) From an Africa-shaped mega solar plant powering Kigali, Rwanda, to a massive geothermal plant harvesting the power of Kenya’s hot springs, renewable energy plants are popping up around the continent. Sub-Saharan Africa is desperately short of power and roughly 620 million Africans live without a reliable source of electricity. Africa’s population is expected to double by 2050 and the demand for clean energy has never been greater, says Caroline Kende-Robb, executive director, Africa Progress Panel. She believes the continent could soon become a renewables superpower, and that it can leapfrog carbon-centered energy systems and go straight to renewables. “Because what we see is that Africa has got the advantage of coming in now without the heavy old systems that a lot of other countries and regions have,” says Kende-Robb. And soon, other parts of the world will look to Africa for expertise when it comes to renewables and energy, adds Kende-Robb. Read: The world’s most polluted city? It is also a question of public health. Many Africans rely on cooking with wood and charcoal, making indoor pollution a big issue — 600,000 people in sub-Saharan Africa die every year from indoor pollution. Most investment goes to large-scale plants, and to hydropower in particular, but small solar power initiatives are also gaining ground — an estimated 5 per cent of households in sub-Saharan Africa now use some form of solar lighting, compared with 1 per cent in 2009. Renewables could help supply cheaper energy to regions where people have to set aside a large chunk of their income to pay for power. “The demand is there, people will find the money and they will pay for it,” says Kende-Robb. The poorest people who live off grid are already paying much higher prices for their power than the world’s rich — with some paying 60-80 times more per energy unit than people in London or New York. In the gallery above, we take a look at some of the super plants already powering millions of households and businesses across the continent with renewable energy.